_MAL6800, originally uploaded by Michael A. Lowry. On Friday I joined Åsa R. for a bit of cliff-climbing. We biked from Tullinge station out to Häggsta, a bit North of Flottsbro, where I went mountain biking last autumn. We parked our bikes at the foot of the cliffs and Åsa hiked around to put the rope through a ringbolt at the top of the cliff. We climbed several routes up the rock, moving the rope to another ringbolt twice. 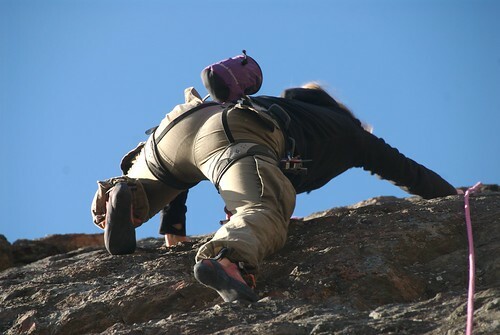 This was my first time in more than a decade to do any outdoor sport climbing. I think I'm hooked! Here are the 30 photos from the day.